These are a few examples of 30 chalices that I was commissioned to make and they were picked up this week. It was a very nice commission in that I got some leeway on design and color selections. They did not want them all to be exactly the same. So I worked with a new sprigging technique for the grapes and the wheat designs. I'll talk more about that later and show how I came up with it. It's an old idea, recycled! 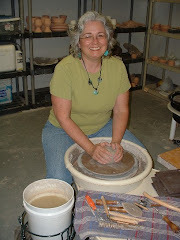 I saw a little blurb on this on the Ceramics Arts Daily site and got really excited because I know Amy, enjoy her work (a little textured plate hangs in my kitchen), and have seen her demonstrations at our Carolina ClayMatters Guild meetings. I also love texture and the little teaser they featured got wheels rolling in my head. So, I ordered the DVD set and it is great. I even watched several of the DVDs while working at the studio because I was having trouble finding the spare time at home. Here I'm holding a new roller that I have used on a lotus leaf tray. I have make about 4 new rollers for use on my botanical themed pieces and am so happy about them. She has a great idea for trays that I intend to incorporate into my work. Just wanted to share some clay inspiration. I'll have some of the new textures at the Claymatters sale in Charlotte on May 12, and also at my Spring Open Studio (more about that soon). I'll be here on May 12th, in Charlotte, along with the rest of the gang from Carolina Claymatters. But we're playing rotating boothspaces this year!That's because the city has fenced off the Barn so we will all have different spaces than before, more than likely. Will try to have a sign out in front of the booth or on the tent so I'm easy to locate. I have GREAT new work that I'm really excited about. Come out, bring friends and think good weather, no wind thoughts.